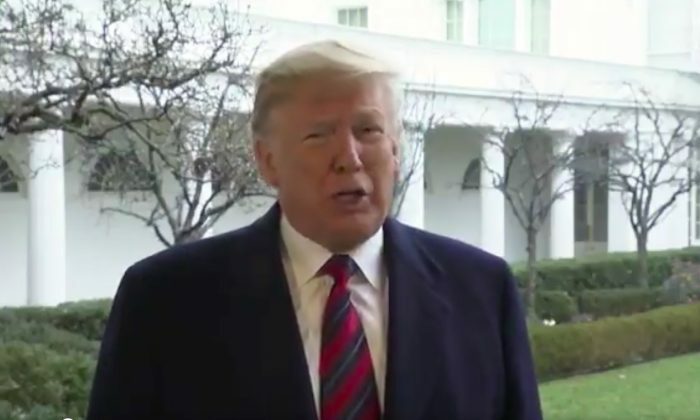 President Donald Trump used his New Year’s tweets, live call-in with Fox News, and his end-of year video to urge Democrats to fund a wall that he says is essential to securing the border. “We need border security and everybody knows it,” he said in a call-in interview with Fox News as they were live in New York City. Trump has asked for $5 billion to build a wall on the border with Mexico to keep drugs, traffickers, and illegal immigrants from entering the country. He has said he won’t sign several appropriation bills until funding for a border wall is included in the package for the Department of Homeland Security. House Minority Leader (and presumptive Speaker of the House) Nancy Pelosi (D-Calif.) and Senate Minority Leader Chuck Schumer (D-N.Y.) have recently been equally adamant that he won’t get funding for a wall. To some extent, this may be semantics as the Democrats say they will fund border security, while Trump insists on funding for a wall. This standoff has resulted in a partial government shutdown that started Dec. 22. When asked by Fox News’s Pete Hegseth how long he would hold out for with the shutdown in its tenth day, Trump indicated it could go on indefinitely. “We have no choice, we have to have border security, and a wall is part of border security,” he said. Possibly reponding to Pelosi’s New Year’s Eve tweet calling the wall “expensive & ineffective,” he compared the wall to a wheel, the first use of which was documented several thousand years ago. Both sides have blamed the other for the shutdown and for not being willing to reach a deal. Trump has pointed out that neither Schumer nor Pelosi stayed in Washington over the holidays to work on a resolution, while the Democrats point to Trump’s refusal to accept their proposals as proof that he is to blame. On Dec. 31, the Democrats put forward a proposal that included two bills to fund most agencies while pushing a decision on border wall funding forward another month. One is a spending bill that would fund six government agencies through September 2019, and the other is a continuing resolution that would fund the Department of Homeland Security at current levels through Feb. 8. House Freedom Caucus Chairman and close Trump ally, Rep. Mark Meadows (R-N.C), called the proposal a “non-starter” because it didn’t include enough funding for the border wall. “Nancy Pelosi’s newest funding proposal doesn’t represent any serious attempt to secure our border or find a compromise,” he wrote on Twitter. Senate Majority Leader Mitch McConnell (R-Ky.) has said he is not willing to put to a vote anything that the president would not sign. Trump also speculated in his Fox interview that the Democrats were holding out because they thought it would help them in the 2020 elections. During his live call-in with Fox News, he was asked if he had any New Year’s resolutions. “Success and health and prosperity for our country,” he said.